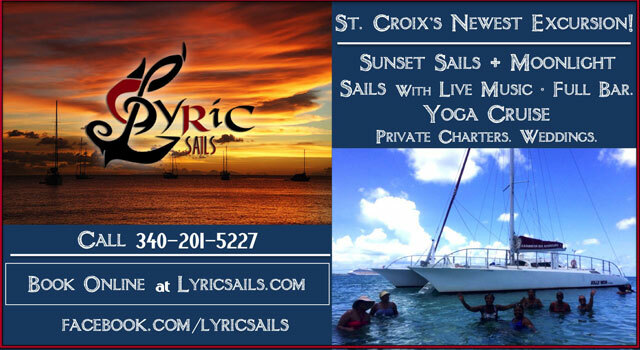 St. Croix is a paradise for water and sports enthusiasts, offering everything from sailing and motor yachting, swimming, snorkeling, and SCUBA diving to riding wave runners, water skiing, parasailing, windsurfing, sailing, sport fishing, horseback riding, tennis, golf and bicycle rentals. There are several wonderful beaches including Cane Bay Beach (right in front of Villa Dawn); Davis Bay, Protestant Cay; Buccaneer, the Reef, and Cramer Park (all near Caribbean Dream) and Rainbow Beach. There are several other beaches that you can explore and find on your own. All beaches are public, even those at the hotels. 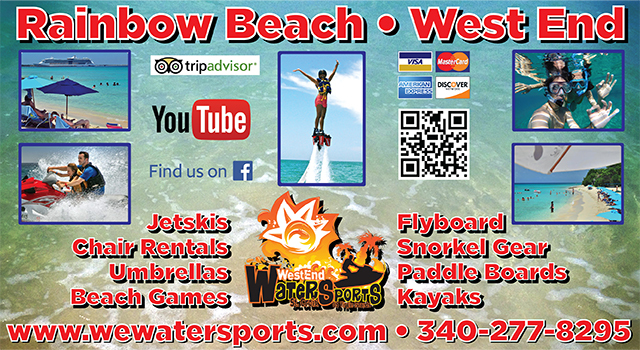 Click here for more information on St. Croix beaches. Big Beards's Adventure Tours - 340-773-4482 - Buck Island Tours, Snorkel Gear & Lessons Included. Full Day or Half Day Sunset Sails, Weddings, Private Charters. Full Day Beach BBQ...all you can eat and drink! Buck Island Charters - Teroro II & Dragonfly - 340-718-3161 - Sail with Captains Heinz and Carl to beautiful Buck Island where you can swim, snorkel and hike to the top of the island. 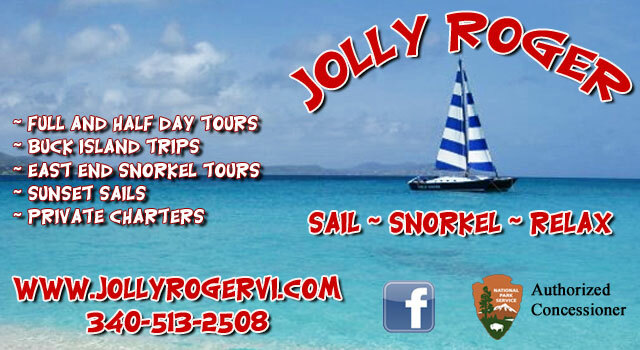 Jolly Roger Charters - 340-513-2508 - Sail, Snorkel, Relax! Full and half day tours, Buck Island Trips, East End Snorkel Tours, Sunset Sails, Private Charters. 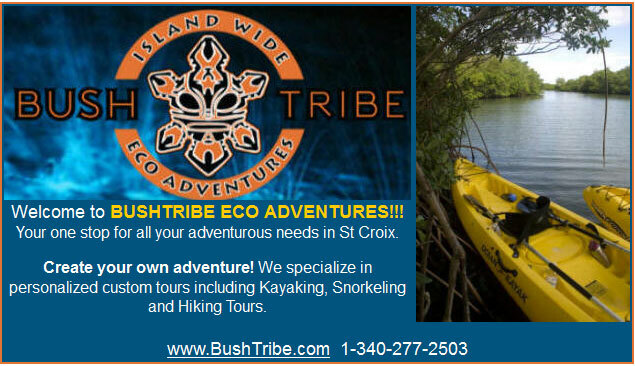 Bush Tribe Eco Adventures - 340-277-2503 - Your one stop for all your adventure needs in St Croix. Create your own adventure! We specialize in personalized, custom tours including Kayaking, Snorkeling and Hiking Tours. SCUBA - Snorkeling - See our SCUBA page for more information. Scuba aficionados consider St. Croix's northern coast to be some of the best scuba diving in the Caribbean, largely because of its spectacular wall diving. In particular, Cane Bay and Salt River Canyon offer experienced divers challenging and beautiful diving destinations. The snorkeling is fabulous here as well - and Cane Bay Beach is right in front of Villa Dawn! Frederiksted, located on the west end of the island, also offers SCUBA divers some great dive sites. You can dive the pier and also some great wrecks. Boats leave from both Christiansted harbor and Frederiksted. In a Top 100 poll taken in "Rodale's Scuba Diving Magazine" readers rated St. Croix #4 overall for "Best overall destination, best visibility and value in the Caribbean, and the world's most popular destination" and # 2 for " best shore diving"! US Virgin Islands placed #2 for "best snorkeling"! Day and night dives available. Prices run from $45 for a one-tank dive. For novices, instruction is available from many reputable dive shops. Cane Bay Dive Shop - 5 minute walk from Villa Dawn and only an 10 minute drive from Caribbean Breeze! Open 7 days a week, packages for all levels 340-773-9913 8-7 p.m. Also a location in Frederiksted at 340-772-0715, 9am - 5pm. Bushtribe Eco Adventure Tours - 340-277-2503, for more information click here. Dive Experience - 340-773-3307 � 800-235-9047 - Located in Christiansted, This is one of our favorite dive shops for boat dives and is conveniently located just 15 minutes from Caribbean Breeze. These waters are ideal for sport fishing and record size catches are common be it Tuna, Wahoo, or Blue Marlin. For a half or full day check out these fishing charters. Fishing St. Croix - "Forever & Always" - 340-244-1335 - Join us in St. Croix on our 35 foot Contender the "Forever and Always" for an exciting day deep sea or inshore fishing in the Virgin Islands. Whatever you desire, whether it be near-shore or offshore, we do not have to travel far to start fishing. 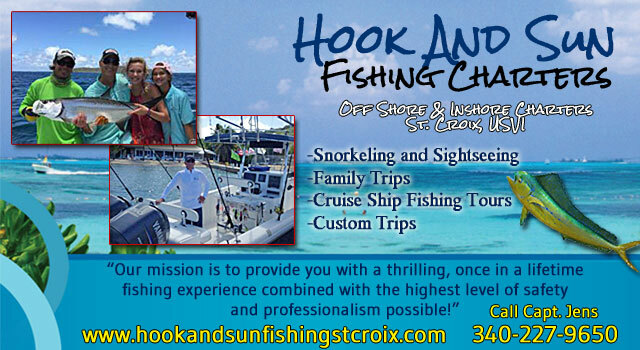 Our team�s goal is to offer you a fun, safe, entertaining fishing experience. We strive to have each guest catch a great fish and experience a trip they will remember. See our ad above. Imagine deep water only one mile offshore. We have been operating fishing charters from St. Croix for over 30 years and are known for our outstanding catches of: Dolphin, Tuna, Wahoo and Marlin. 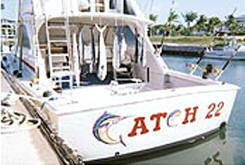 Join Captain Dave for a day of "catching" aboard Catch 22, a 38' Bertram wide body sport fisherman. CATCH-22 will take you to some of the best off shore fishing grounds in the Caribbean Sea! (Prices may vary according to fuel surcharges. All trips must be cancelled within 48 hours to receive a refund. If trips are not cancelled within 48 hours the credit card will be charged the full price of the charter.) Maximum Six (6) passengers. Trip includes: bait & tackle. All fish stay with the boat, but Capt. Dave will be happy to provide the angler�s with a portion of the catch for dinner. Freedom City Surfboard Shop and Grill - 340-227-0682 - Stand Up Paddle Adventures, St. Croix's ultimate Stand Up Paddle Board and dining experience. We offer lessons, daily rentals, SUP fitness, customized SUP safais and of course our famous SUP parties for kids and adults. Open 7am to sunset every day. Located just north of the Frederiksted pier, across from the ball park. Tennis buffs can find public courts near the Fort in Frederiksted (1 court) or at Canegata Park (3 courts - lighted) in Christiansted. There is great riding in St. Croix that allows riders to go past Danish ruins, rain forests and other coastal areas. Cruzan Cowgirls - 907-841-1990 - Come join us for horseback riding in St. Croix! Equus Horseback Riding - 340-642-4567 - "Ride where the mountains meet the sea" - morning and evenings, reserve 24 hours ahead - Located close to Villa Dawn and only an 8 minute drive from Caribbean Breeze. Tamarind Reef Hotel - 773-4455: 6 wicket croquet court, open to public. $ PP for 11/4 hour. Call for reservations.